May’s featured iSeahorse observation is a trio of jaw-dropping action shots, courtesy of user thumbwave (aka Craig Chaddock). 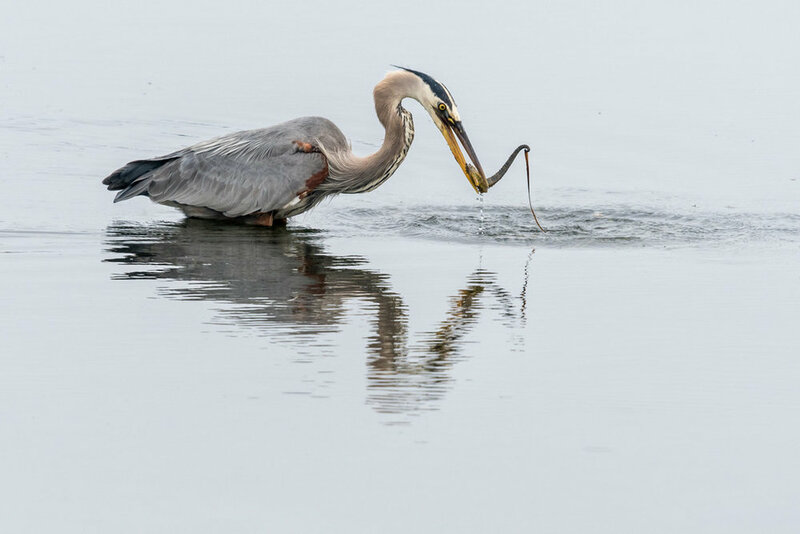 The intrepid citizen scientist witnessed a great blue heron (Ardea herodias) pick up and immediately let go of a Pacific seahorse (Hippocampus ingens), which clutched its grassy holdfast throughout the ordeal. 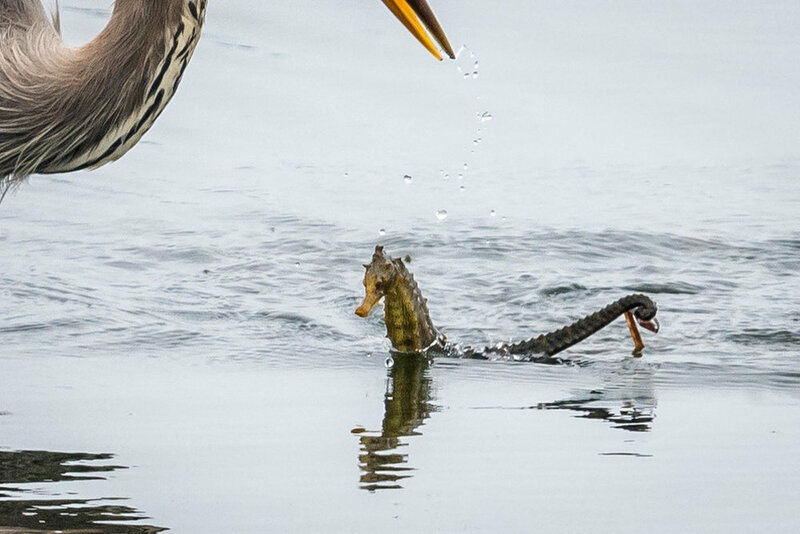 After the seahorse was dropped, Craig managed to capture the split second before it vanished beneath the water’s surface. From this novel angle, the seahorse almost looks like a mini Loch Ness monster. Seahorses, though predators themselves, are preyed upon by a wide range of animals. More than 80 species have been found with seahorses or pipefishes in their bellies. Examples of known seahorse snackers are loggerhead sea turtles, fairy penguins, skipjack tuna, spottail porgies and horn sharks. Because of their low abundance and meagre caloric value, predators probably feed on seahorses opportunistically, rather than being specialized to hunt them. Pacific seahorses, which are Vulnerable (IUCN Red List), are far more threatened by the shrimp trawling industry than by opportunistic predators such as great blue herons. So why was the heron’s catch released? Was it a slip of the beak or an outright rejection? Seahorses have bony plates instead of scales and aren’t very nutritious, so perhaps the bird simply didn’t have time for a crunchy, skimpy meal. Regardless of why this happened, there’s no question that these photos were impressively timed. Thanks for sharing with us, Craig! June’s featured seahorse is a giant seahorse (Hippocampus ingens), spied off the coast of Baja, California by iSeahorse user afelix, despite some masterful camouflage.